I didn’t think much about balance when I first started my full-time job. Since then, I’ve learned to make an effort to make time to have a morning routine where I can meditate/do yoga and get into the office a little later because of that. I also make sure that I have enough time at the end of the day to do something fun, whether it be self care or being with my husband or friends. I also used to check emails at all hours, but have changed that so now I don’t check my emails past 8:00pm and don’t check them in the morning until I get to work. I know that if there is an emergency, someone will call or text me. I don’t think it is possible to have it all. I believe that you have a set of goals/priorities in your life that align with your values. I set goals for each year and think that I can accomplish those. What you focus on manifests, but you definitely have to prioritize and can’t have everything you want all at the same time. I don’t love either of those terms, but if I had to choose I guess I would go with work-life integration :). I’m a bit of a worker-bee, so even if I’m not doing something for my day job, I will find projects to do for fun. I have a hard time simply relaxing and not doing anything productive, but now that I’ve realized that about myself I make it a priority to set time aside for myself. I’m working on getting better at taking time to meditate. The “Calm” app helps me a lot with that! I use the app “Trello” to really organize my life. I highly recommend that! I also usually keep my phone in the other room at night so I don’t have it in the bedroom when I go to sleep. This helps me decompress and focus on what I should be doing—sleeping! Creating. I love anything craft or art related. I find my flow when I’m brush lettering or doing something of that sort. To not pretend like I was the same as all my friends and that life is better when I’m completely myself. There isn’t one specific thing—I hope that I continue to keep learning something every day and that I’m always open to growth. Deep cleaning! I’m good at picking up clothes and things of that nature, but not so good at the deep cleaning. Any job where I could teach happiness principles and inspire people to live their happiest lives. Any job that doesn’t involve human interaction. I need to have conversations with people throughout the day to help fuel me. Fiction: The Alchemist by Paula Coelho. Nonfiction: Big Magic by Elizabeth Gilbert and The Untethered Soul by Michael A. Singer. I read a lot of novels for fun. As far as nonfiction, I’m in the middle of re-reading The Happiness Project by Gretchen Rubin. Food? Gluten-free chocolate chip cookies from Tate’s. They are soo good! I think I: find the most joy in helping others learn how to be happier. I wish I: wasn’t affected by negative people as much as I am. 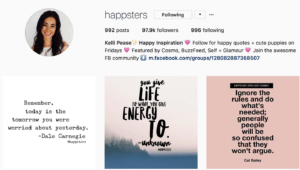 Kelli Davis Pease is the founder of the happiness movement, The Happsters. She has been featured by publications including Cosmopolitan.com, Buzzfeed.com, Self.com, and Glamour.com. She loves learning about ways to make ourselves happier and thinking of new ways to spread happiness. 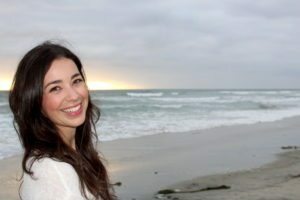 Kelli completed the “Science of Happiness” course through UC Berkeley’s Greater Good Science Center and continues to learn more every day about how tools and techniques can help you become the happiest version of yourself. You can follow her on Instagram for daily happiness inspiration.